When In Rome — PUDJEEB | a visual journal by pj. The final stop of our 10-day vacation in Europe was Italy's capital: Rome! We drove from Sorrento to Rome, stopping by an outlet on the way, and arrived in the city just before evening rush hour traffic kicked in. We had two full days in Rome (three nights) and most of it was spent walking around both key tourist attractions and local streets near our restaurants. We visited the Vatican City, home to countless famous art and architectural landmarks including St. Peter's Basilica and the Sistene Chapel. The scale and details of everything there was unbelievable and these few photos really don't do them justice. Evening sunset on our first dinner in Rome at La Pergola. Food and service were quite a let down for being Rome's only three-star Michelin restaurant, so no food photos made the cut! 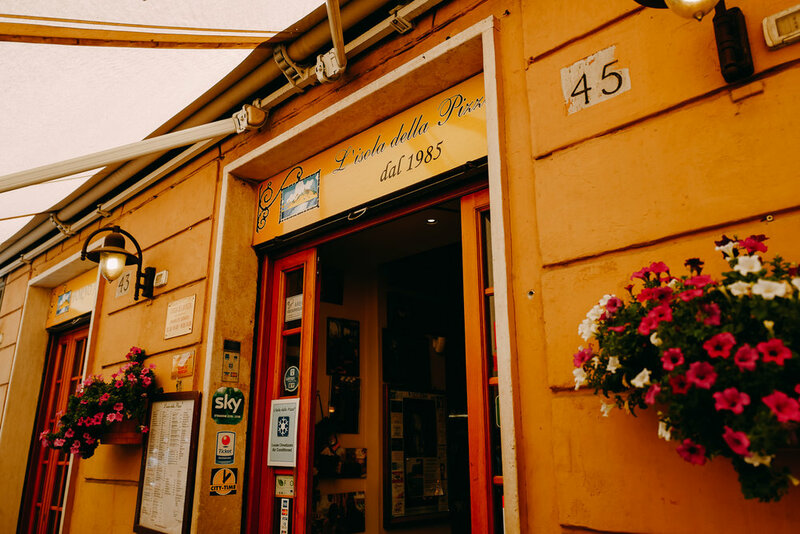 By this point in the trip, we were so ready and quite desperate for some local Italian pizza and L'Isola della Pizza really hit the spot for us. Along with some refreshing appetizers, cold beer, and tiramisu, our overall experience here was authentic and amazing. We walked off our lunch at the Colosseum which was blazing hot that afternoon. Before dinner time, we took an evening stroll to see the Trevi Fountain (Fontana di Trevi) and was stunned by the crowd it drew. Turns out this was normal, but we also happened to witness a cute marriage proposal and the entire crowd cheered for the happy couple afterwards. Dinner was at Al Moro, a small restaurant tucked in a quiet street between two bustling ones. It seemed to be a local's favorite: all the other guests were not tourists and the menu was in Italian only! Our server was very generous and entertaining and we had a nice pasta-filled meal. The following day was also spent wandering around between tourist attractions and food places. We visited the Piazza Venezia, Pantheon, Spanish Steps, and Piazza Navona. Our meals today were not as memorable as the ones I've mentioned so far, so I chose to leave those photos out from here. Venchi, although famous and nice-looking from the outside, had really bad service. The staff gave us condescending looks right when we entered. Please don't bother - there are so many other friendly shops around! Discussing how rude the staff at Venchi were. Saying goodbye to Rome concluded our family trip for the summer. The ten days went by fast, but we were also ready for some home-cooked meals and to be sleeping in our own beds again. I know it sounds cheesy and all, but what I really do love most about our trips together are the times spent during meals and conversations in the hotel at night. We don't see each other all that often and there's something about sitting down face-to-face in a foreign town (with some wine) that brings people together closer than ever before. Photos by my family and me. Hi there! This photo journal by 'PJ' (Pavika B.) is a space for her to document, reflect, and share stories and moments from her life as a creative, currently figuring out what it means to be a Thai-American woman in Silicon Valley. You can read more about PUDJEEB and about her motivations for starting it here. To view her design work, visit her portfolio. Please give full credits, including a link to this URL, for any photography usage elsewhere. Feel free to contact PJ with any questions.